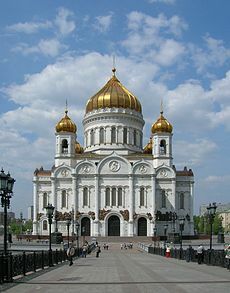 Russia (also the Russian Federation) is a country which is mostly in Asia and partly in Eastern Europe. It is the largest country in the world by land area. About 145 million people live in Russia. The official name for Russia in English is The Russian Federation. The capital city of Russia is Moscow. Russia shares borders with Norway, Finland, Estonia, Latvia, Lithuania and Poland (both via Kaliningrad Oblast), Belarus, Ukraine, Georgia, Azerbaijan, Kazakhstan, China, Mongolia, and North Korea. It also has borders over water with Japan by the Sea of Okhotsk, and the United States by the Bering Strait. Russia is a federal semi-presidential republic. It has a president and a parliament. 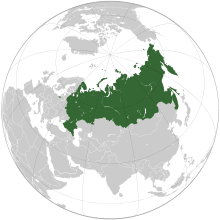 Russia consists of 85 federal subjects (territorial units). All subjects of the federation shall be equal. All entities are subject to the uniform federal law. Subjects of the federation have two representatives in the parliament. Subjects of the Russian Federation does not have a right to withdraw from its composition. Important issues are decided by the Federation President; lesser powers are delegated to the member republics. At the end of the twentieth century, Russia has experienced a series of political upheavals. Russia is on the path of democracy at the moment..
By the 18th century, the nation had expanded through conquest, annexation and exploration to become the Russian Empire, the third largest empire in history. It stretched from the Polish-Lithuanian Commonwealth eastward to the Pacific Ocean and Alaska. The empire was ruled by an emperor called the Tsar. 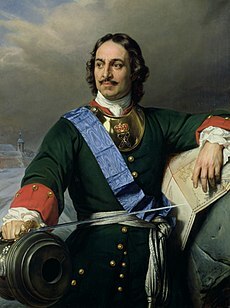 Peter the Great ruled Russia from 1689 until 1725. Peter moved the capital from Moscow to a new city that he built named Saint Petersburg. He made Russian society more modern in many ways. The government under Peter the Great began building ships for the Russian navy. From the 1920s to the 1950s, Josef Stalin ruled as an absolute dictator. After the death of Lenin, Stalin took over and destroyed anything that was against him ruling, including taking the property of farmers and shopkeepers, causing many millions of people to starve and die. Stalin also removed, or "purged", all military personnel who were not loyal to him, and many were killed or sent to prison camps for many years. Soviet Russia and Nazi Germany agreed not to attack each other in 1939. But in June 1941, Nazi Germany attacked Russia. The attack was part of World War II. The war lasted in Europe until May 1945, and Russia lost 27 million people during that time. In spite of this large loss, Russia was one of the winners of the war and became a world superpower. The privatization largely shifted control of enterprises from state agencies to individuals with inside connections in the government system. Many of the newly rich businesspeople took billions in cash and assets outside of the country . The depression of state and economy led to the collapse of social services. Millions plunged into poverty, from 1.5% level of poverty in the late Soviet era, to 39–49% by mid-1993. The 1990s saw extreme corruption and lawlessness, rise of criminal gangs and violent crime. Other famous poets and writers of the 19th century were Anton Chekhov, Mikhail Lermontov, Leo Tolstoy, Nikolai Gogol (he was born in what is now Ukraine, but during his lifetime Ukraine was a part of Russia), Ivan Turgenev and Fyodor Dostoevsky. Tolstoy and Dostoevsky are considered by many people to be two of the greatest novelists ever. Three Russians won the Nobel Prize for Literature in the 20th century: Boris Pasternak (1958), Mikhail Sholokhov (1965) and Aleksandr Solzhenitsyn (1980). Mikhail Bulgakov's The Master and Margarita was also a novel of the highest quality. Since the 1952 Olympic Games, Soviet and later Russian athletes are in the top three in gold medals collected at the Summer Olympics. The 1980 Summer Olympic Games were held in Moscow while the 2014 Winter Olympics will be hosted by Sochi. ↑ "The Russian federation: general characteristics". Federal State Statistics Service. http://www.gks.ru/scripts/free/1c.exe?XXXX09F.2.1/010000R. Retrieved 5 Apr. 2008. ↑ "Всероссийская перепись населения 2010 года. Том 1 [2010 All-Russian Population Census, vol. 1)]" (in Russian). Всероссийская перепись населения 2010 года (2010 All-Russia Population Census). Federal State Statistics Service. 2011. http://www.gks.ru/free_doc/new_site/perepis2010/croc/perepis_itogi1612.htm. Retrieved June 29, 2012. ↑ 3.0 3.1 3.2 3.3 "Russia". International Monetary Fund. ↑ "Distribution of family income – Gini index". The World Factbook. CIA. https://www.cia.gov/library/publications/the-world-factbook/fields/2172.html. Retrieved 13 January 2011. ↑ "2011 Human development Report". United Nations Development Programme. pp. 148–151. http://hdr.undp.org/en/media/HDR_2011_EN_Table1.pdf. Retrieved 5 November 2011. ↑ "The names Russian Federation and Russia shall be equal". "The Constitution of the Russian Federation". (Article 1). http://www.constitution.ru/en/10003000-02.htm. Retrieved 25 June 2009. ↑ "Beware Russia, energy superpower". thefirstpost.co.uk. http://www.thefirstpost.co.uk/4883,news-comment,news-politics,beware-russia-energy-superpower. Retrieved 14 April 2010. ↑ "Commission of the Russian Federation for UNESCO: Panorama of Russia". Unesco.ru. http://www.unesco.ru/en/?module=pages&action=view&id=1. Retrieved 29 October 2010. ↑ Library of Congress. "Topography and drainage". http://countrystudies.us/russia/23.htm. Retrieved 26 December 2007. ↑ "The Constitution of the Russian Federation". (Article 80, §1). http://www.constitution.ru/en/10003000-05.htm. Retrieved 27 December 2007. ↑ White, Stephen (2010). "Classifying Russia's Politics". In White, Stephen. Developments in Russian Politics 7. New York: Palgrave Macmillan. ISBN 978-0-230-22449-0 . ↑ Sakwa, Richard (2010). "Politics in Russia". In White, Stephen. Developments in Russian Politics 7. New York: Palgrave Macmillan. ISBN 978-0-230-22449-0 . ↑ "Russia". Encyclopedia Britannica. http://www.britannica.com/eb/article-9109504/Russia. Retrieved 2008-01-31. ↑ 18.0 18.1 excerpted from Glenn E. Curtis (ed.) (1998). "Russia: A Country Study: Kievan Rus' and Mongol Periods". Washington, DC: Federal Research Division of the Library of Congress. http://www.shsu.edu/~his_ncp/Kievan.html. Retrieved 2007-07-20. ↑ 19.0 19.1 19.2 "Russian Federation" (PDF). Organisation for Economic Co-operation and Development (OECD). http://www.oecd.org/dataoecd/7/50/2452793.pdf. Retrieved 24 February 2008. ↑ Sciolino, E. (21 December 1993). "U.S. is abandoning 'shock therapy' for the Russians". The New York Times. http://query.nytimes.com/gst/fullpage.html?res=9F0CEED91F39F932A15751C1A965958260. Retrieved 20 January 2008. ↑ "Russia: Economic Conditions in Mid-1996". Library of Congress. http://lcweb2.loc.gov/cgi-bin/query/r?frd/cstdy:@field(DOCID+ru0119). Retrieved 4 March 2011. ↑ "Russia: Clawing Its Way Back to Life (int'l edition)". BusinessWeek. http://www.businessweek.com/1999/99_48/b3657252.htm. Retrieved 27 December 2007. ↑ "Russia pays off USSR's entire debt, sets to become crediting country". Pravda.ru. http://english.pravda.ru/russia/economics/22-08-2006/84038-paris-club-0. Retrieved 27 December 2007. ↑ Aslund A. "Russia's Capitalist Revolution" (PDF). http://www.iie.com/publications/papers/aslund0108.pdf. Retrieved 28 March 2008. ↑ Treisman, D. "Is Russia's Experiment with Democracy Over?". UCLA International Institute. http://www.international.ucla.edu/article.asp?parentid=16294. Retrieved 31 December 2007. ↑ Stone, N (4 December 2007). "No wonder they like Putin". The Times (UK). http://www.timesonline.co.uk/tol/comment/columnists/guest_contributors/article2994651.ece. Retrieved 31 December 2007. ↑ "A Tale of Two Operas". Petersburg City. http://petersburgcity.com/news/culture/2005/11/18/theatre/. Retrieved 2008-01-11. ↑ Microsoft® Encarta® Online Encyclopedia 2007. "Russian Literature". 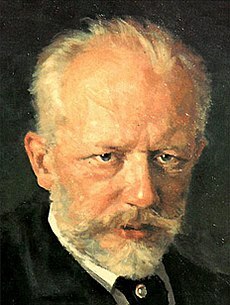 http://encarta.msn.com/encyclopedia_761564269/Russian_Literature.html. Retrieved 2008-01-07. ↑ Kelly, Catriona. Russian Literature: A Very Short Introduction (Very Short Introductions) (Paperback). Oxford Paperbacks. ISBN 0192801449 . http://www.amazon.co.uk/Russian-Literature-Short-Introduction-Introductions/dp/0192801449. ↑ "Russian literature; Leo Tolstoy". Encyclopedia Britannica. http://www.britannica.com/eb/article-29157/Russian-literature. Retrieved 2008-04-11. ↑ Otto Friedrich. "Freaking-Out with Fyodor". Time Magazine. http://www.time.com/time/magazine/article/0,9171,943893,00.html?promoid=googlep. Retrieved 2008-04-10. ↑ Tom Van Riper and Kurt Badenhausen. "Top-Earning Female Athletes". Forbes. http://www.forbes.com/2008/07/22/women-athletes-endorsements-biz-sports-cx_tvr_kb_0722athletes.html. Retrieved 2008-08-01. This page was last changed on 18 December 2014, at 21:51.